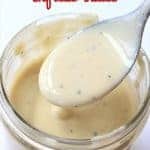 This Easy Homemade Alfredo Sauce can be made from scratch with just 4 simple ingredients. Great for topping your pasta or for your casserole dishes. Make it with fresh Parmesan and you will find it much better than store bought. In a large pan over medium low heat, melt butter. Add heavy cream and wisk to combine. Allow to simmer, whisking occasionally, for 6-7 minutes. Add Parmesan cheese and whisk continuously until the cheese is melted. Add cooked pasta or use in another recipe.